Visit these outdoor rinks in and around Canmore, Lake Louise, Banff National Park, Invermere and Fernie. Ask any player, from the young kid who’s just learning how to skate, to NHL veterans, and they’ll tell you there’s nothing quite like pond hockey. There’s a reason the NHL stages a number of outdoor games each year — many of the pros grew up playing shinny on an outdoor patch of ice and it remains a key part of the hockey experience. Add amazing mountain scenery to your outdoor game and you’ve truly scored an epic winter day. Here are some hockey “ponds” in the mountains to shoot for this winter. Gap Lake, Kananaskis Country. Photograph by Jake Finnan, courtesy of Travel Alberta. When in Canmore, the outdoor rink in the middle of town (a.k.a. “The Pond”) is a reliable spot for shinny. But if you want to step things up, head east on Highway 1A to Gap Lake. Though it’s just a 10-minute drive from the town of Canmore, Gap still feels like a secret spot, with views of the Rockies on all sides and thick ice that freezes so smooth and clear, you can see cool-looking bubble formations under the surface. You’ll find everything from pick-up games to local teams hosting special organized practices at Gap, but since it’s bigger than your average ice pond, there’s room enough for everyone. Lake Louise, Banff National Park. Photograph courtesy of Fairmont Chateau Lake Louise. Set against the stunning backdrop of the Victoria Glacier, it’s not just the scenery that makes Lake Louise so amazing for hockey. It’s also the quality of the ice, which is meticulously maintained by the staff at the Fairmont Chateau Lake Louise hotel. The grounds team floods the skating area for weeks prior to its official opening and maintains it with daily flooding by a tractor equipped with a water tank. There are separate areas for pleasure-skating and for hockey and the hockey pond is always bustling with guests and locals, so you’re bound to find a good game. 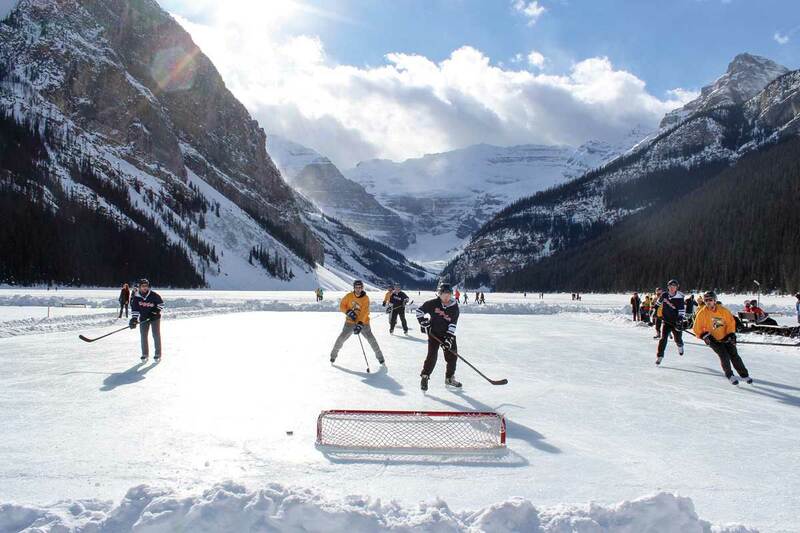 The hotel creates additional hockey rinks for its annual Lake Louise Pond Hockey Classic tournament in February, though the 24 team spots tend to get snapped up before they’re even available to the public, as entries from previous years get first dibs. 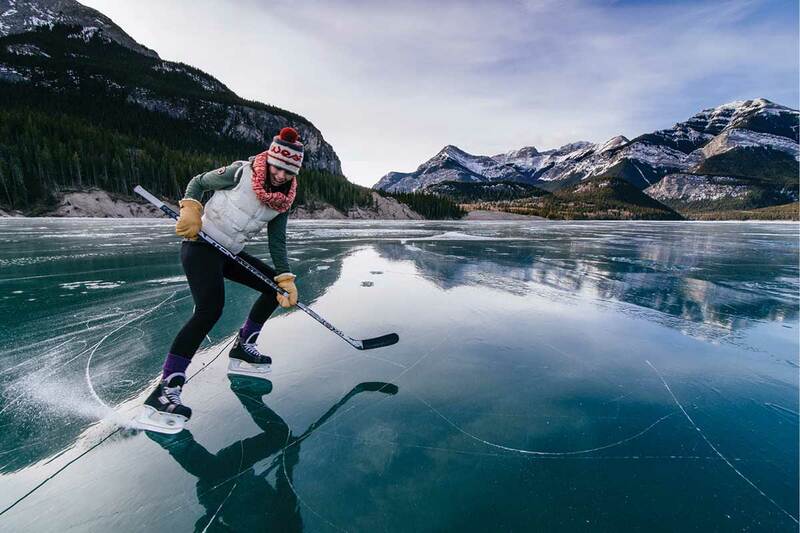 These adjacent lakes in the eastern part of Banff National Park both offer stunning settings for shinny. Located along Lake Minnewanka Scenic Drive, just a 15-to-20-minute drive from the town of Banff, Minnewanka and Two Jack are easily accessible, yet remain slightly under the radar as skating spots. Unlike Lake Louise, no one officially maintains the ice, so you might have to roll up your jersey sleeves and do a bit of shovelling, though the strong winds that blow across larger Lake Minnewanka definitely help keep the surface clear. As with any other natural ice surface, check that the ice is an appropriate thickness before stepping out — the Red Cross recommends a minimum of 15 centimetres for individual skaters and 20 cm for skating parties or games. Lake Windermere Whiteway. Photograph by Zoya Lynch. The sprawling B.C. 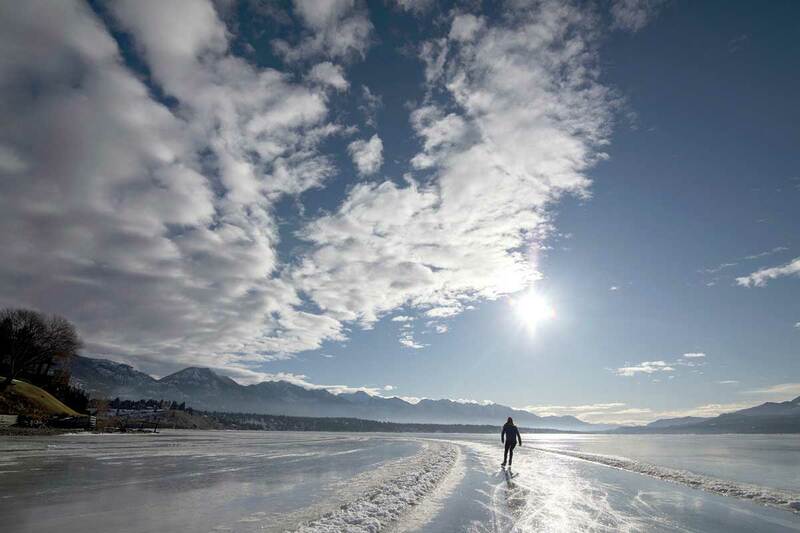 lake where many Calgarians own vacation homes becomes a skating mecca during the cold months, with the 30-km Lake Windermere Whiteway up there among the longest continuous groomed skating trails in the world. 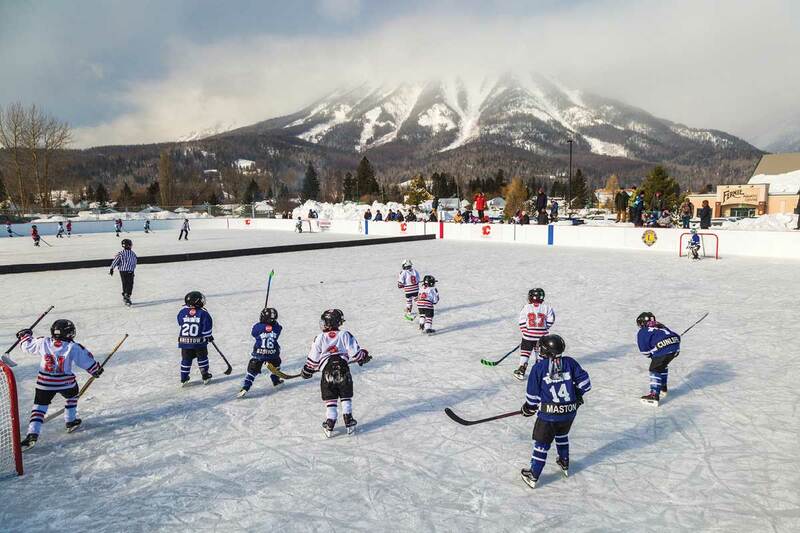 During the winter, hockey rinks dot the lake, while the ice surface at Kinsmen Park in the community of Invermere plays host to the annual BC Pond Hockey Championships, a four-on-four (no goalies) tournament put on each year in January by the Columbia Valley Rockies junior hockey club. Fernie Outdoor Rink. Photograph by Tourism Fernie/Vince Mo. With NHL-sized ice, full boards, heated change rooms and a Zamboni that floods daily, the outdoor rink in Fernie rivals many indoor facilities. The rink’s origin story has tragic beginnings, however. On Oct. 17, 2017, Wayne Hornquist, Lloyd Smith and Jason Podloski died from exposure to an ammonia leak at the Fernie Memorial Arena. With the indoor arena shut down, the Fernie Lions Club, the City of Fernie and the Calgary Flames Foundation joined forces to build an outdoor rink, with a goal of having it finished by Christmas that year. In addition to the $60,000 donation to kick off construction the Flames Foundation also donated the boards, penalty boxes, player benches and a timekeeper box. The new outdoor rink was unveiled on Dec. 21, 2017. Though the indoor arena has since reopened for the 2018-2019 hockey season, the outdoor rink remains popular with locals and visitors alike. It’s free of charge to use with designated time slots for shinny and floodlights that stay on until closing time at 10 p.m. Set against the views of the surrounding Elk Valley, it’s an exceptional way to experience the good old hockey game.